While Shelter Lennox Head could well be an ideal spot or ‘shelter’ to seek refuge from bad weather with a warming brew and bite or something grown up from the bar, it’s in fact the perfect place to perch during glorious sapphire sky and crystal ocean days, with one hundred and eighty degree views overlooking Seven Mile Beach. Be warned: if you’re in the box seats, you might even spot a whale or two having a fin slap of a time just off shore. 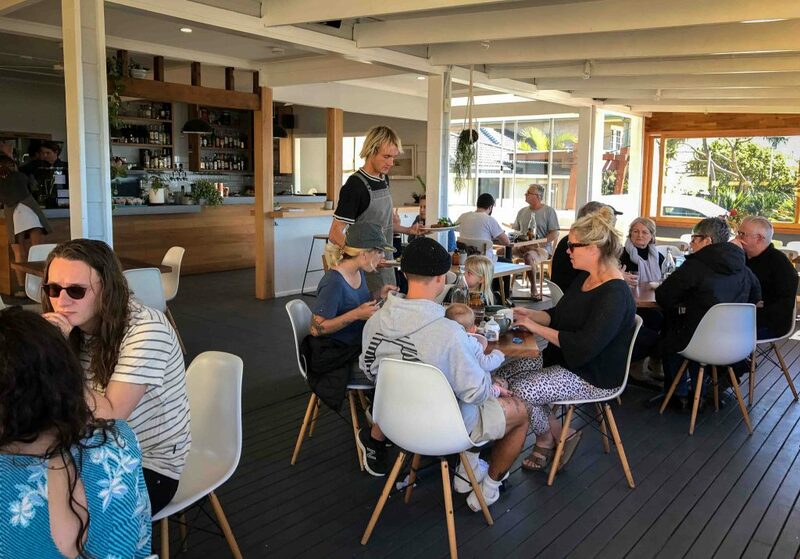 Shelter is one of Lennox Head’s newest establishments. 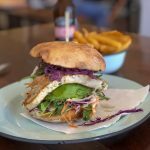 The seven day a week café / restaurant has taken up residence at 41 Pacific Parade – the former home to Foam and, for those of us old enough to remember, Seven Mile Beach Café. 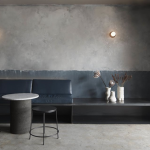 Shelter is the creation of three blokes with connections to Three Blue Ducks at The Farm Byron Bay – general manager Andy Love, manager Troy Noonan and Grant La Brooy, the brother of Ducks’ co-owner and chef, Mark. The restaurant space at Shelter has been given a light and bright spruce with understated styling, but attention to detail where it counts (love those leather belt straps for rolling the blinds). There are splashes of greenery to contrast the smooth blonde timber, white walls and THAT panoramic view through endless windows. There are a few tables outside, if you prefer the fresh air, but my preference is inside the shelter for the full experience. 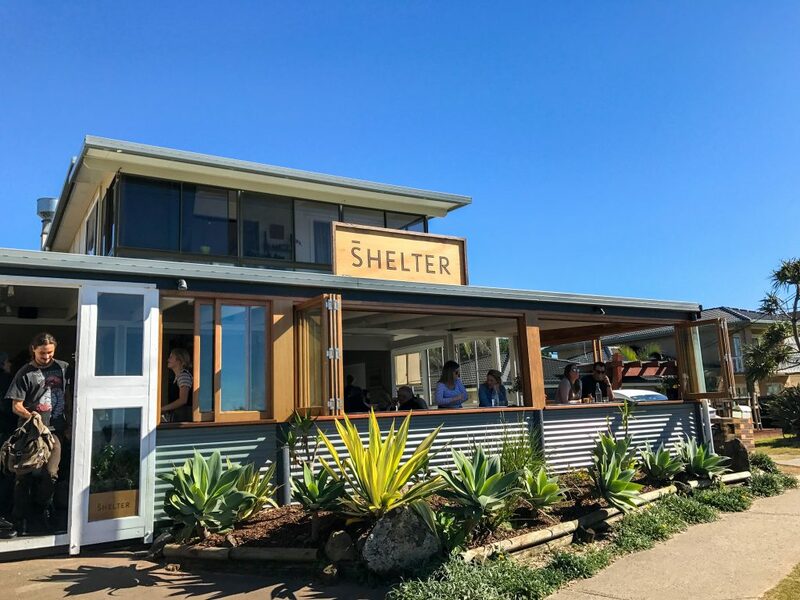 Shelter Lennox Head is currently serving breakfast and lunch seven days a week from 6.30am – 3pm and dinner Thursday to Saturday from 5pm -10pm. 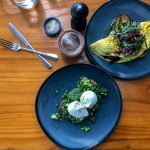 I decided that I wasn’t going to write a blog post about Shelter until I had experienced breakfast, lunch and dinner there – as well as a plenty of ‘working’ coffees in between! I’ve got to say that each visit has been a very different occasion, but each one exceptional. Let’s start with breakfast. 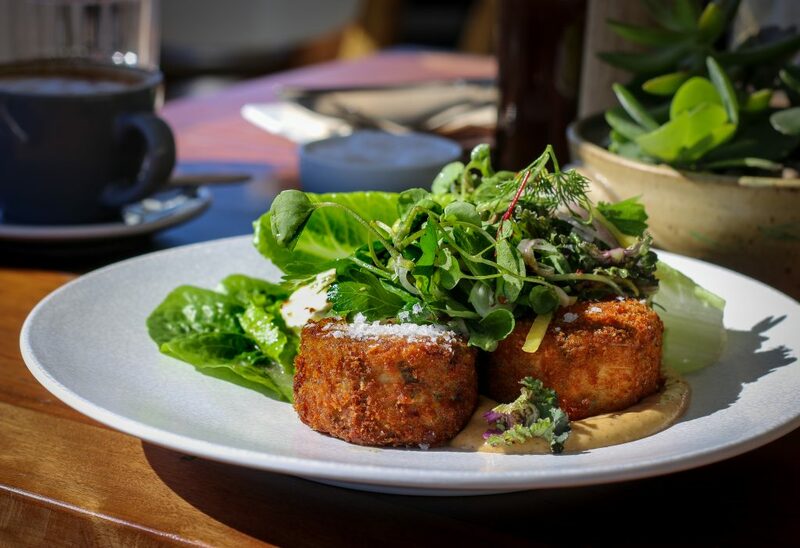 On the current menu, order the Fish Cakes on your first visit, and work your way through the menu from there. They might not be what you’re expecting, but they make an amazing breakfast or brunch. The white fish inside is flakey and not overworked while the light crumb on the outside is a delicate crunchy contrast. Served with poached eggs, gentleman’s relish, parsley, capers and eschallots, it is a unique dish and oh so good. 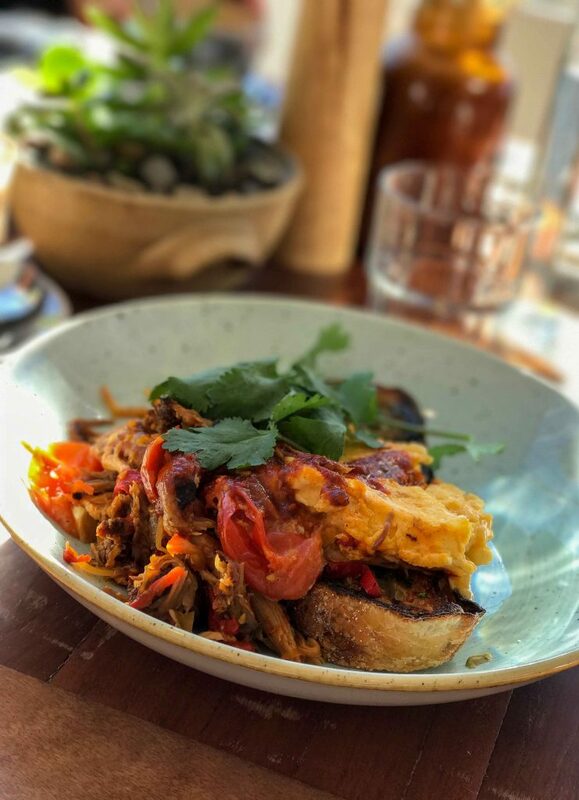 For something a bit more from the ‘man food’ genre, try the Tasty Pork and Eggs, which is a hearty breakfast of pulled pork served with scrambled eggs, harissa, smoked chilli sauce, coriander and sourdough by the legendary folk at The Bread Social. The breakfast menu at Shelter features other classics like Avo Toast, House Made Granola and the Bacon and Egg Roll. While Shelter has views from every table, I recommend taking a seat at the window bench for breakfast, where you can feel the breeze and smell the ocean air. 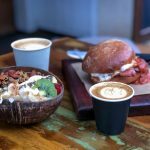 For lunch, it’s quite a different affair – a definite nudge up from the classic coastal breakfast where it it’s okay to wear board shorts. Shelter at lunchtime takes a step up the sophistication ladder, making it the perfect venue for a long group lunch. The solid lunch menu makes decisions tough. The Gnocchi is a perfect mid-sized lunch. 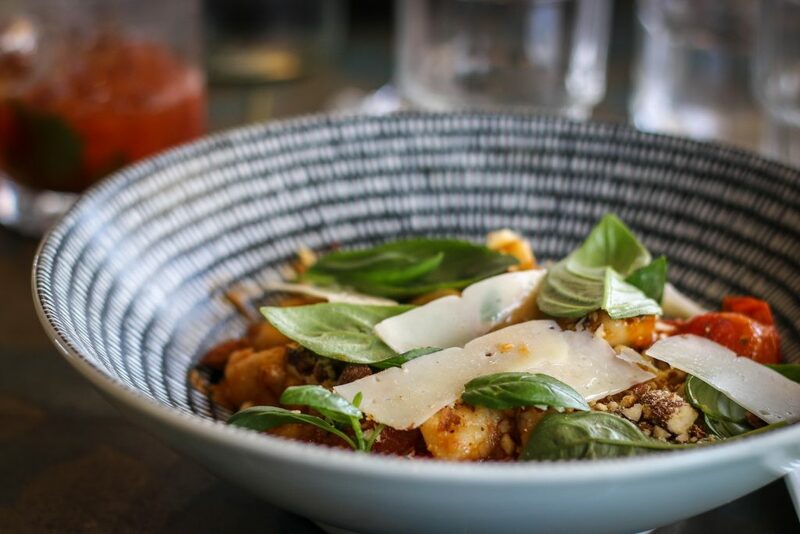 Small, super fluffy pillows of potato gnocchi are served with a tomato and basil sauce, roast almonds for crunch and shaved pecorino for saltiness. It’s balanced and heavenly. 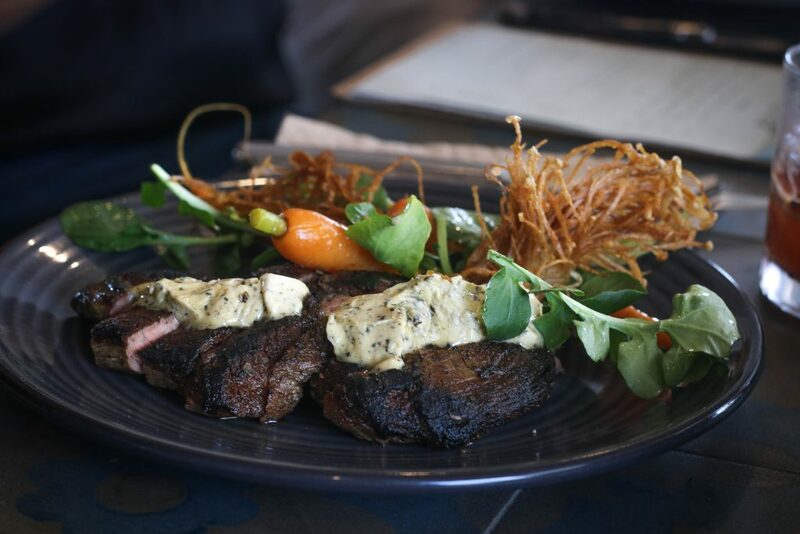 At a recent ladies lunch, (I sometimes get time to indulge) the gals were raving about the Beef Flank – grass fed beef, anchovy and nori butter with pickled dutch carrots, upland cress and fried enoki mushrooms that were like a sculpture on the plate. I’m going back for the Brodetto di pesce – a seafood stew with fish of the day with local pipis, black mussels and The Bread Social crunchy sourdough. Did I mention that all eating plans are catered for at Shelter if you’re gluten free, vegan, vegetarian or dairy free? Now to dinner. Things go up yet another notch. Definitely no board shorts please. Even in daylight savings. Okay? We were a little blown away by our recent dinner experience. We had heard good things about dinner at Shelter but they absolutely surpassed our expectations. The dinner menu at Shelter is designed as a tapas/ shared style of smaller dishes, which I love, as you get to taste twice as many dishes in a couple! 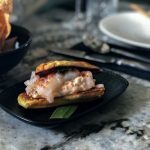 To make decisions easy and to have a sense of surprise we went with the Chef’s selection – a dinner of three courses, a side dish and a dessert each for $65 a head. I won’t list every dish here, as there were 10 of them, but after very little debate between Mr GFAF and I, there are four that we agreed were at the top of our experience of Shelter’s new Spring Menu. Raw fish, avocado, onion seaweed and wild rice. The fish was snapper, caught just off Lennox Head, we were told. The puffed and toasted wild rice gave a great textural contrast to the soft raw snapper and was the perfect way to start our mini-degustation and awaken the palate. Octopus Squid Ink, Grapefruit, Leef and Sea succulents. Wow. Beautifully char grilled ‘occy’ with a squid ink mayo type dipping sauce that was rich and worth bottling, little pieces of acidic grapefruit to cut through the rich sauce with sweet roasted leek and salty sea blite fronds for balance. Semolina gnocchi with pumpkin, hazelnuts and kale. The golden gnocchi were pan fried and light and fluffy inside with a gentle crust so as to look like the delicate pieces of roast pumpkin they sat alongside. Chocolate, wattle seed, raspberry and hazelnut. We have never tasted a chocolate ganache quite so good. Served with ice-cream it took on a gently chewy texture. The raspberry fruit wrap was a great way to add another layer of raspberry flavour alongside fresh berries. It was a simple but well executed dessert that left you wanting more. And I never order dessert! It would be remiss of me not to mention the Kipfler potato side dish. I know potatoes are super simple, but they were seriously good and you must indulge. We were blown away by dinner at Shelter. Measuring the experience to other top dinners in the area on the way home, we agreed right away that Shelter is certainly near the top of the list. Right now, bookings are recommended, but I feel it won’t be long before diners will need to book some time in advance to get a dinner reservation. The cocktail and drinks menu at Shelter is thorough and it was nice to see some regional wines represented, like Toppers from New England, which I recognised from the Three Blue Ducks wine list. 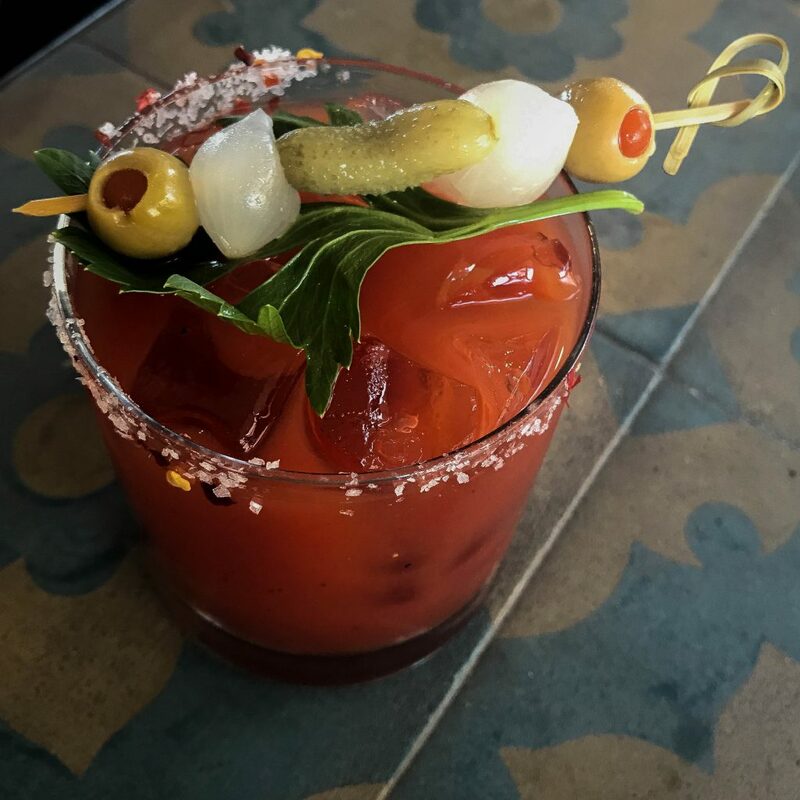 The service at Shelter is always friendly, sharp and en pointe. I need to add that the night we were in for dinner we were treated to a blood red moon rising above the Pacific Ocean. We watched it morph and transform throughout dinner and as we were leaving it illuminated the coastline. There aren’t many restaurants in our local area where it’s possible to experience that dining room view day and night. 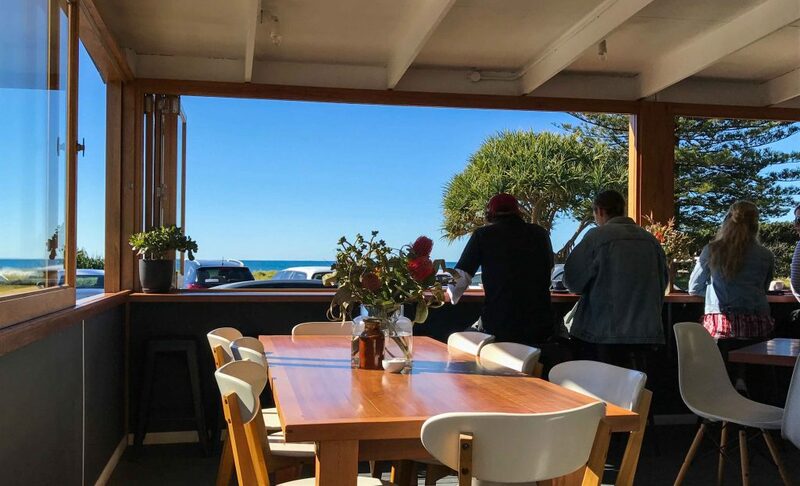 Shelter Lennox Head is a great place for breakfast and lunch with a view, but it is definitely a new refuge for Mr GFAF and me (and anyone who wants to join us!) when looking for a sophisticated and quality dinner experience, if you’re prepared to leave the shire. Don’t forget to book!